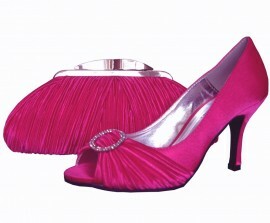 Elegant fuchsia pink ladies shoes from the Lunar Elegance range, which are perfect for special occasions and weddings. Rouche detailing over the toe and a diamante encrusted brooch for that extra added sparkle. 8.5cm satin covered heel and padded insole for extra comfort. Unfortunately we have sold out of the matching handbag, to match these beautiful fuchsia evening shoes. The evening shoes and matching bag are also available in navy blue. Pink evening shoes are a must have accessory for any special occasion.